There’s never a better time for unlimited¹ calling to Nottingham than the present. So let us help you get in touch with our top plan — Vonage World®. Say hello to your most cherished loved ones back in the UK, and say goodbye to high prices. It might take some getting used to the idea, but cheap calls to Nottingham do exist. You’re just moments away from gaining access to them too. 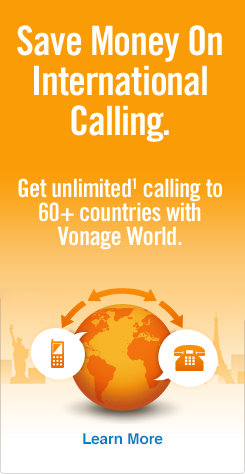 Vonage World allows for calling UK from USA to any landline you want for as long as you want¹. You can also connect to cell phones in Nottingham for a small per-minute rate. As if that wasn’t enough, Vonage World offers unlimited¹ calling to landlines in over 60 countries and mobiles in more than 10 countries. It’s all done through the Vonage BoxTM, which costs nothing for activation or delivery. You simply plug the Vonage Box into your high-speed Internet connection and start dialing. Easy, right? It is, although figuring out international dialing can pose a bit of a trickier problem. Then, dial 115 — the Nottingham area code (landlines only*). Finally, finish with the local 7-digit Nottingham phone number. *To call Nottingham mobiles, the steps are very similar to those in dialing a landline. Just start with the US/Canada exit code, then the UK country code, but then you need to press the 7 button. Finally, dial the 9-digit cell number. If you’re still uncertain, click on our how to call the UK guide link for more city/area area codes. Nottingham is perhaps most famous for its association with the legend of Robin Hood, but this is a city that has truly embraced modernization. Its bus system is the most extensive in the UK, and many agree that, though, only a fraction of the size, its nightlife and theatre scene are rivaled only by London. So get to Nottingham and enjoy one of the UK’s many world-class destinations.